These words by Canadian professor, philosopher and public intellectual Marshall McLuhan danced around inside my helmet as I departed Carmel by the Sea, a small, picturesque beach community on California’s Monterey Peninsula. In 1964 McLuhan published a book to challenge our assumptions on how and what we communicate, titled Understanding Media: The Extensions of Man. Through his writings he proposes that a medium itself, not the content it carries, should be the focus of study. He said that a medium affects the society in which it plays a role, not only by the content delivered, but also by the characteristics of the medium. I had brought McLuhan’s genius along for this ride in hopes of finding influence and greater vision for our future with META. "Here I will find peace. Here I shall find the strength to do the work I was made to do." This journey to Carmel and beyond was a celebration of the platform we have built as an independent publisher over the past four years. It was time for us to slam on the brakes and stare down that rear-view mirror as we wash our souls in preparation for finding a sustained sanctuary in the elusive “blue ocean.” The blue ocean strategy is a business theory that suggests companies are better off gaining uncontested market space than competing with similar companies in a shark-infested red ocean. This luxury time in an incredibly inspiring environment, void of outside communication, helped move our minds into a visionary state. Heading north from Los Angeles and into the winding Central Coast back roads, we counted off mile after beautiful mile, earnest in anticipation of the beaconing coastal offerings found west of the Santa Lucia Mountains. Mythic in reputation, Big Sur seemed to be the ideal destination for our retreat. 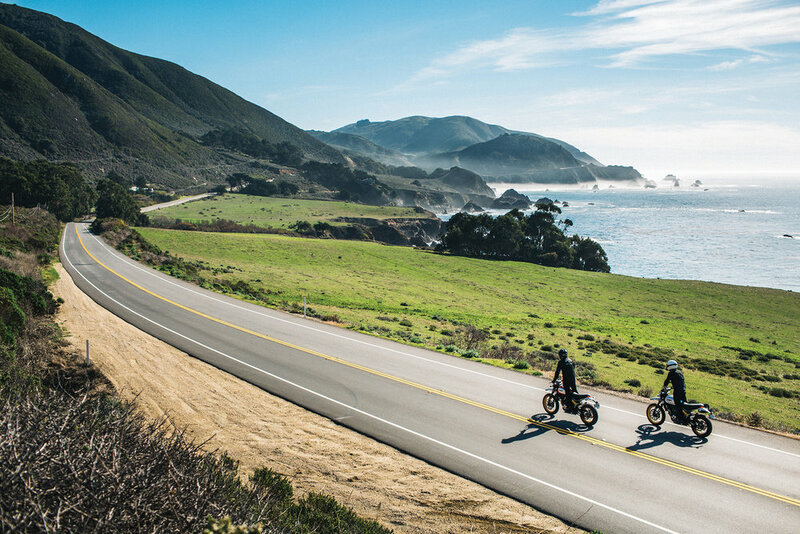 Recognized as one of the most beautiful coastlines anywhere in the world, simply put, this place is a motorcyclist’s dream come true. Ancient redwoods gently swing above the jagged coastline, casting shadows of enormous stature along the rocks and beaches below. With each twist and turn, the picturesque views never seemed to end. I could spend days going on about how special this region is, and with every stop we made, I could not stop talking about how incredibly grateful I was to be here. Enthusiasm was at an all-time high, and the incredible riding will be remembered in my dreams for years to come. "It was here in Big Sur that I first learned to say 'Amen'"
Influence was abundant along the journey, and our core values surfaced many times throughout the trip. We believe in pursuing a life well ridden, and we stand by our beliefs. Our job is to inspire, relate and connect with our community through documented stories that come to life through our medium. Purpose, meaning and freedom are influences we hope to instill in others by way of example. This is how we measure success. Doing what we love and being able to share this life we have chosen is what fuels our efforts. "One's destination is not a place, but a new way of seeing things." There is something pure about drawing inspiration and putting it to work. That process is what allows us to keep drifting towards that blue ocean. And it’s something that we hope inspires others along the way.